With the World Chess Championship 2014 set to open tomorrow, it would only seem fitting if I were to analyze one of the games from the WCC 2013. Here I will pick Game 9, which was a double-edged and highly exciting game where Anand was going all out for a win. Unfortunately, he gave way under immense pressure, blundered and had to resign instead. The variation 5... Be7 6. e4 dxe4 7. fxe4 e5 8. d5 keeps the bishop pair, but allows White to build a large pawn centre. With 4. f3 White's plan was to push e4 and gain central space, hence Black's last move was aimed against d4 so as to delay e4. After 7. e4 dxe4 Black's Queen increases the pressure on d4. A very interesting move ("ambitious"-- Daniel King) by Carlsen. By advancing this pawn Black has several goals in mind: (1) To deprive White's light squared bishop of the e3 square, (2) To create a potential outpost on b3 with the maneuver Nc6-Na5-Nb3, and (3) To prepare his queenside pawn majority for a general attack. The downside to this move, however, is that it relieves the pressure on d4, allowing White to safely play e4 and hit Black's weak pawn on d5. We see action across the entire board: White threatens to roll his pawns over the kingside, before swooping in his pieces with the ultimate goal of mate on g7. In return, Black seeks counterplay on the Queenside, and hopes to use his pawn majority to create a passed pawn on that wing. Moreoever, his last move not only sets the pawns in motion, but also allows for ... Ra6 later on as a possible defense on the kingside. Fireworks on the kingside, centre, and queenside; who wouldn't want to watch such an exciting game? In post-analysis the sacrificial line 15. e4 dxe4 16. fxe4 Bxg4 17. 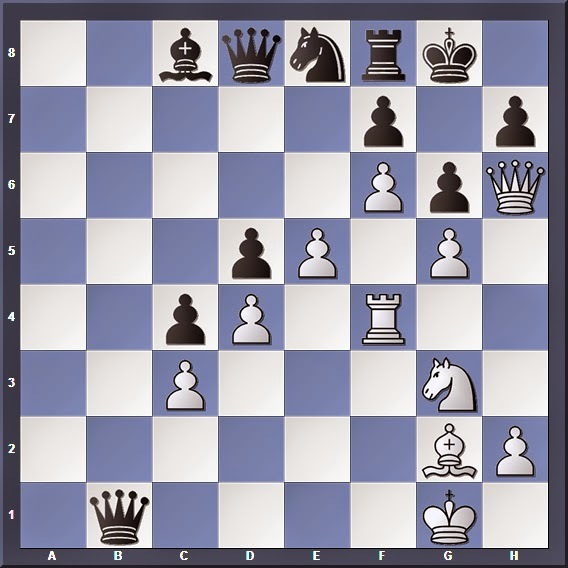 Qe1 was proposed, but after 17... Ra6 White has the better chances. Notice that all this while Black had been letting his knight sit calmly on b3 rather than exchanging it straightaway. The reason is simple: His knight was much better than White's bishop, which was trapped by his own pawns. However, after 16. e4 the bishop's path is opened and has potential to create trouble on the kingside, so Black eliminates that threat. Carlsen spent more than 20 minutes on this move; he admitted that he felt nervous after 18. e5. At the press conference he pointed out that while the variation 18... g6 exploits the weak f5 square after the e5 advance, he did not like the position after 19. f4 Ng7 (aiming for 20... Nf5) 20. Rb2 Rb6 21. Qb1, where Black can aim at b5 and f5. Following 21... Qd7 22. f5 Nxf5 23. Nxf5 gxf5 24. Bh3! Black's dual weaknesses on b5 and f5 do not look appealing. Another proposed variation is 18... f5 but after 19. gxf6 gxf6 20. f4 Black's kingside is dangerously exposed. Black is about to get a passed pawn on the Queenside. However, his knight is now miles away from the king... not a good place to be in especially when the enemy pawns are about to storm the kingside! Anand's vigorous attack is characteristic of his playing style in his youth. Played after 45 minutes of thought. 23. f6 g6 24. Qf4 Kh8 25. Qh4 isn't fast enough because of 25... Rg8/25... Nc7. The knight comes back just in time to prevent mate on g7. 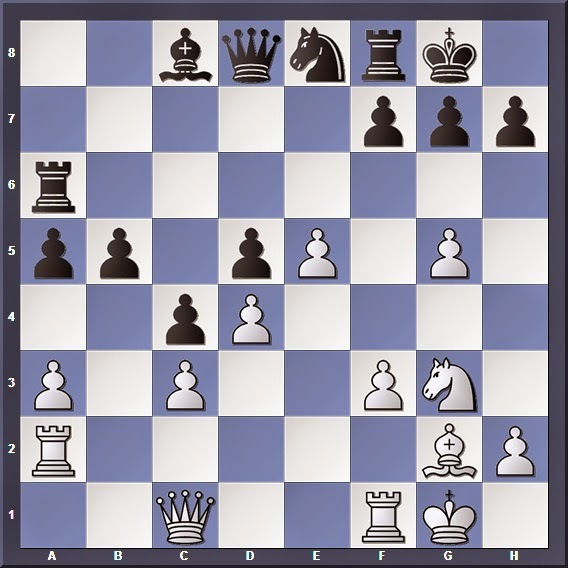 The other candidate move 25... Ne6? also defends g7, but the knight is vulnerable to enemy pieces: e.g. 26. Bh3 Qc7 27. Qh6 Bb7 and all might seem safe after 28. Bxe6 fxe6 since the Queen now defends g7. 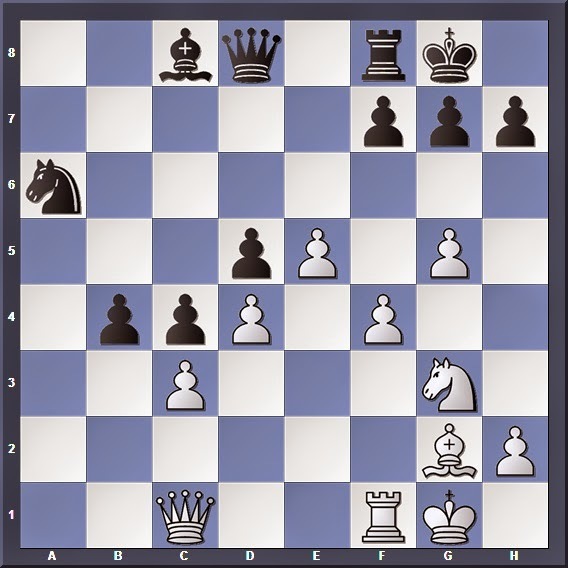 However, White's Bh3 is not just to chase away the knight; it also helps to sink his own knight into f5! So after 28. Nf5! (threatening 29. Ne7 followed by 30. Bxe6) 28... Re8 (28... gxf5 29. Bxf5 Re8 30. Qxh7+ Kf8 31. Qh8#) 29. Nd6 Black's position is simply falling apart. 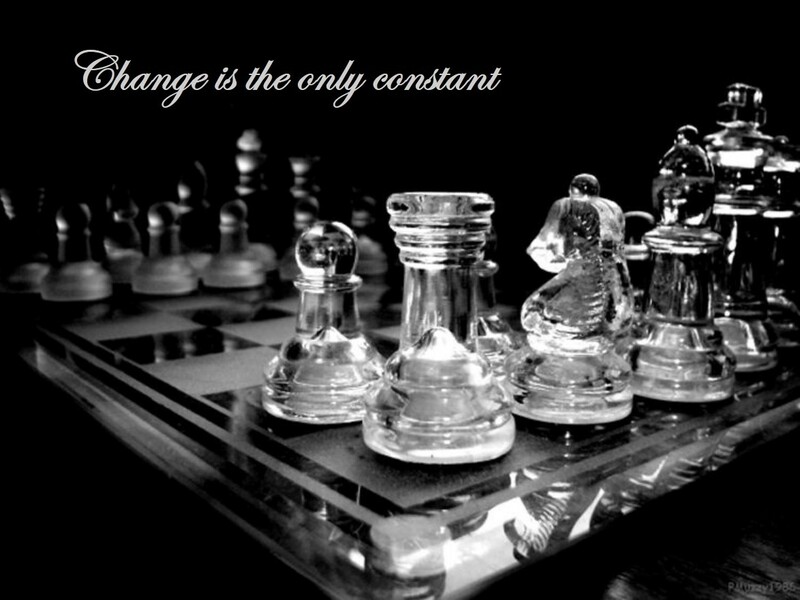 Hence, 25... Ne8 ensures that the knight remains safe from all these problems. Strong counterplay by Carlsen; now the rook lift is answered by a promotion with check. 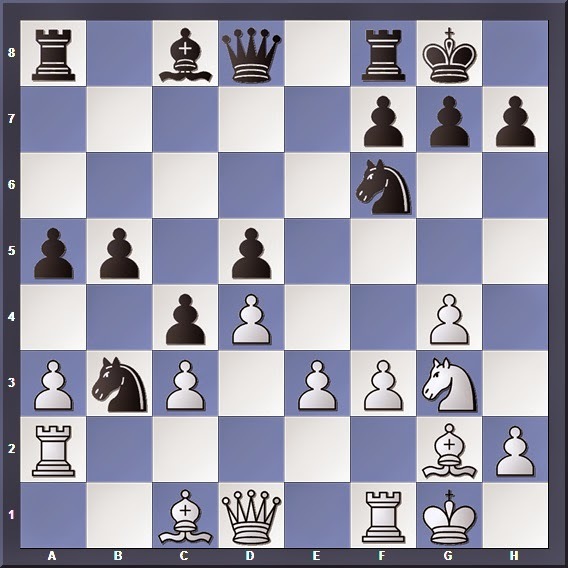 Black has two Queens, but the threat of getting mated on h7 (after Rh4) is very dangerous. After 28. Bf1, the best defence here is 28... Qd1! 29. Rh4 Qh5 30. Nxh5 gxh5 31. Rxh5 Bf5! 32. Bh3 Bg6 (not 32... Qd7? 33. g6!) 33. e6 Nxf6 (Black gives back his extra material to protect his king) 34. gxf6 Qxf6 35. Re5 fxe6 36. Qe3. Here Black is a pawn up, but White still has his chances since the e5 pawn is weak. Totally overlooking the fact that moving the knight clears the e1-h4 diagonal for the Queen. "When I got to this position, I suddenly saw [28. Nf1 Qd1 29. Rh4 Qh5 20. Rxh5 gxh5 21. Ne3] and the knight is coming to e7. By a miracle, black will probably play Be6, for Bxd5 he might have to play Qxd5. For a second I got excited. The problem, I missed the knight which was on g3 has just moved. As soon as I put the knight on f1 I knew what I had done. What can I say?" Anand simply resigned, for after 29. Rh4 Qxh4 30. Qxh4 White has no more attack, and ends up a rook down. Q: (Amit Karmarkar, The Times of India) Magnus, it was quite tense today. Can you describe the tension you were going through? A: (Magnus Carlsen) It was really tough game. From the opening it was clear it going to be unbalanced. And I run a serious danger of getting mated which I hadnt in previous games. I had to deal with the situation. I had to create counterplay. It was really tough game. Q: (FIDE Press Officer) Were you scared in any particular moment in this game? 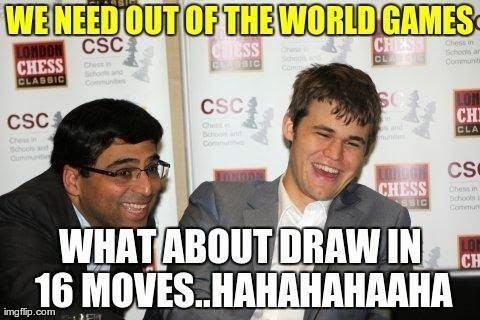 A: (Magnus Carlsen) Basically all the time. The white pawns look extremely menacing. At the same time I was trying to calculate this as well as I could. I did not find a forced mate. It seems there wasn't any mate. At least no obvious one. At the end of the day, it all depended on who could remain more calm under those circumstances and outlast his opponent. Carlsen's tenacity allowed him to do that, and he eventually clinched the world title with a 3 point lead. 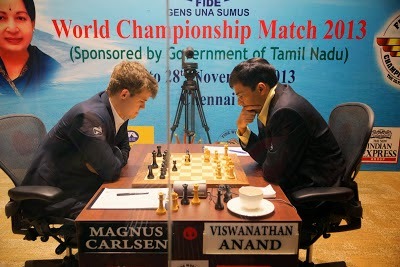 But definitely, the Anand that Carlsen will be facing in a couple days time will be a much better person than the Anand of 2013. He will be more well prepared, and ready to fight it out more aggressively. So it seems that an exciting 3 weeks of WCC 2014 awaits us!